This beautiful musical jewellery box makes a quality keepsake gift for any young girl celebrating her second birthday. 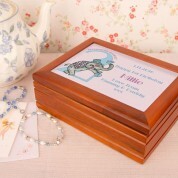 She can store all her jewellery in it for safe keeping, and can display it in her nursery or bedroom. The design on the white metal features an Entertaining Elephant in front of a "2", With the child's name, date of birth and short personal message, making this a truly personal gift. The box also plays a classic tune when opened, and has a luxurious red velvet lining.